when out and about. I also love to look for and know where many active nests are located. surrounding leafy trees sprout. Here are a few recent nest photos. Today, the Chesapeake Bay region hosts the largest concentration of Bald Eagles in the lower 48 states, where there are over 1200 pairs of Bald Eagles currently breeding. Interesting fact: The largest recorded Bald Eagle nest was in St. Petersburg, Florida, at 9.5 feet diameter, 20 feet deep, and weighed approximately 3 tons. That was one hefty nest! there are many more unseen. Even while driving backroads, I’ve sighted many nests. Those were all Bald Eagle treetop nests. I had also mentioned in my post title of Eagle beach nests. hundred miles south of me. Eagles nesting on open beaches? Read on for the full article and amazing photos. Sometimes no matter how long you have worked with a species and no matter how wild you let your imagination run, you just cannot anticipate what they will do next. The Center for Conservation Biology has mapped and inspected more than 5,000 eagle nests over the past few decades but we never expected to see them taking up residence on the open beach. A newly constructed eagle nest was discovered by the Cape Charles Christmas Bird Count crew on the north end of Smith Island on 30 December 2018. The nest was isolated out on the open beach. This nest would later have two eggs and on 30 March the adult was observed brooding small young. Amazingly, on 1 March 2019 Alex Wilke would find a second beach nest with a young eaglet on Ship Shoal Island. Christmas Bird Count crew pose with a new eagle nest on the north end of Smith Island on 30 December 2018. Photo by Michael Male. Eaglet in a new beach nest found on south Ship Shoal Island by Alex Wilke on 1 March 2019. A horned grebe was the prey of the day in the nest. Photo by Alex Wilke. The beach nests discovered in early 2019 represent the 4th and 5th ground nests constructed on the Virginia Barrier Islands in recent years. 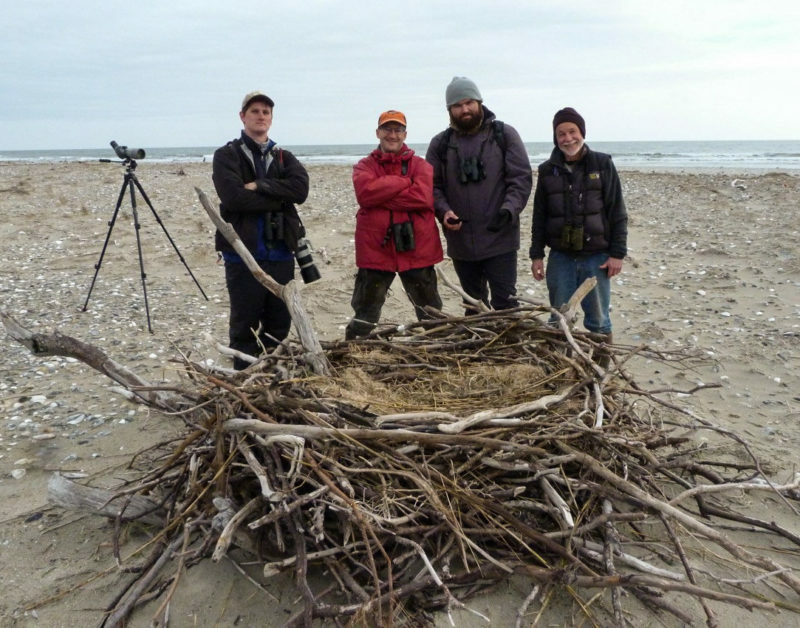 On 26 April 2013, while flying shorebird surveys along the barrier islands, Bryan Watts and Barry Truitt discovered an eagle nest built on the ground on the north end of Little Cobb Island. 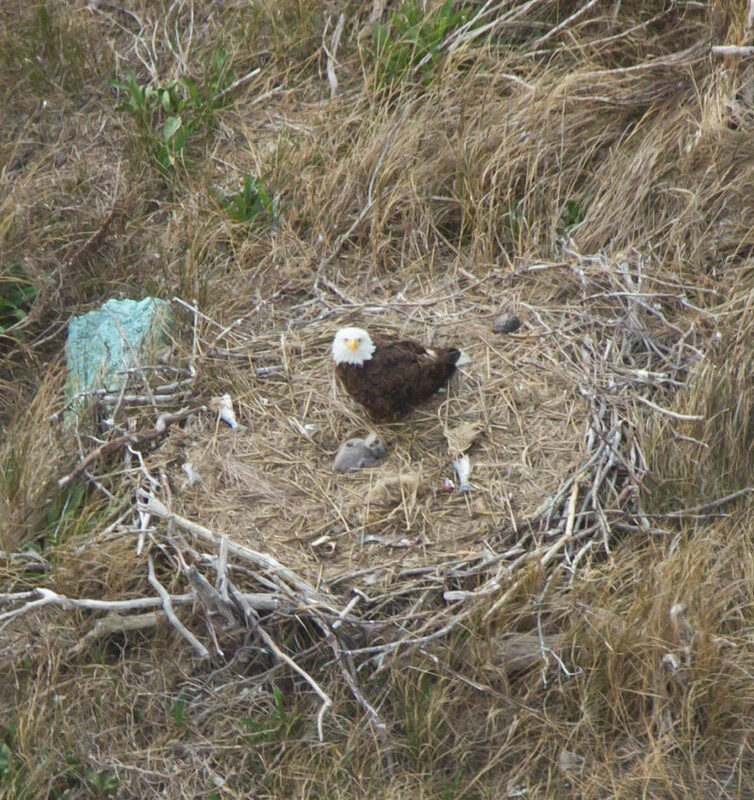 On 5 June 2013, while conducting surveys for beach-nesting birds, Ruth Boettcher discovered an eagle nest built on the ground on Cedar Island. 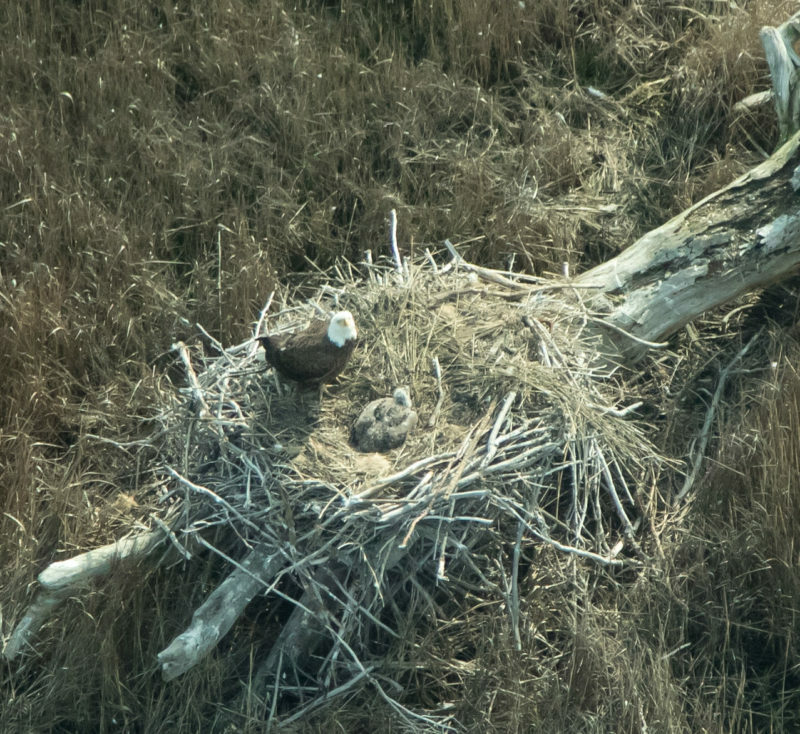 On 1 June 2018 Bryan Watts and Bart Paxton, while flying colonial waterbird surveys, located an eagle nest built on a log on the back side of Wreck Island. These previous ground nests were in the dunes or on the back side of the islands. What makes the two new nests different is that they were located between the primary dune and the active surf zone, a position subject to overwash during high tides or storms and a place normally reserved for nesting plovers, terns, and oystercatchers. 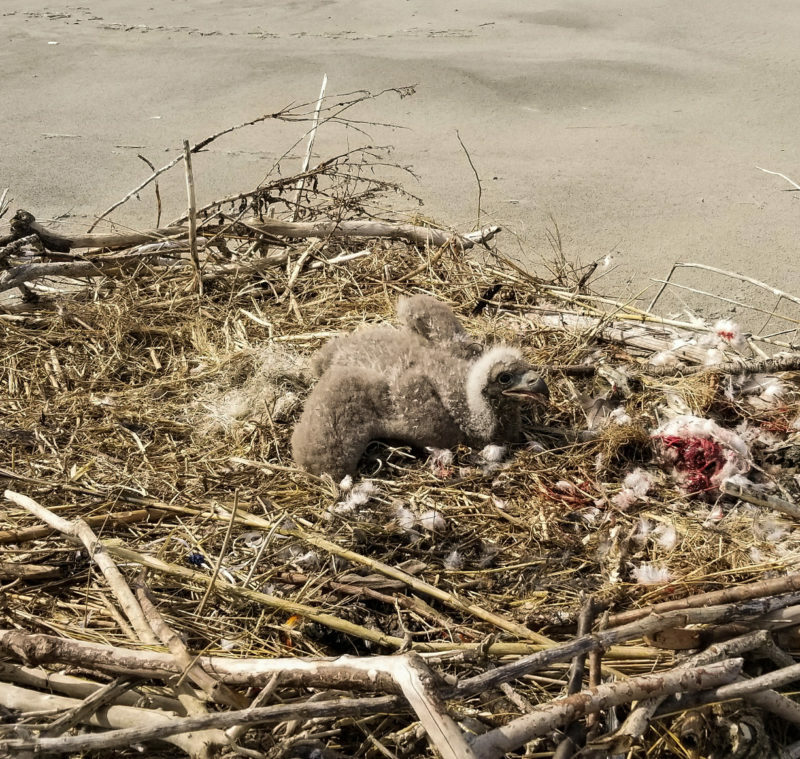 Nest out on the beach on north Smith Island with adult brooding small eaglets on 30 March 2019. Photo by Bryan Watts. Adult attending young on nest built on a log along the edge of the marsh on the back side of Wreck Island – 30 March 2018. Photo by Bryan Watts. As with the other sea eagles, bald eagles are tree nesters. Outside of the treeless Arctic, ground nests are very rare. Only a few have been found since the late 1800s, and most of these have been on predator-free offshore islands with examples coming from British Columbia, coastal Texas, and isolated mangrove keys in Florida Bay. 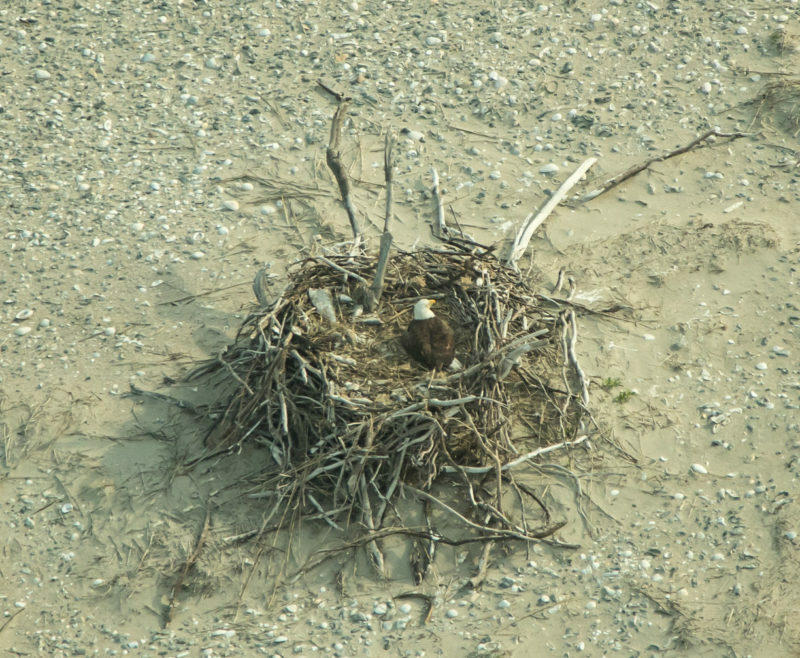 The ground nests represent a larger movement of nesting eagles from the mainland of the Delmarva Peninsula out to the barrier islands. On a survey of the islands conducted on 30 March 2019, Bryan Watts and Mitchell Byrd located 14 active nests on the islands including 1 nest on Fisherman Island, 2 nests on Smith Island, 1 nest on Ship Shoal Island, 1 nest on Wreck Island, 1 nest on Little Cobb Island, 2 nests on Hog Island, 1 nest on Revel Island, 2 nests on Parramore Island, 2 nests on Wallops Island, and 1 nest on Chincoteague Island. All of these nests had either young or incubating adults. Despite the abundant prey around the islands, there is little recorded history of eagles nesting on the islands. Prior to 1960 we know of a single record of a pair on Parramore Island. Beginning in the mid-2000s pairs started to nest on a couple of the northern islands, and by 2010 a pair colonized Parramore Island. By 2011 there were 4 nests on the islands and by 2016 there were 11 nests. Adult attending young eaglet on a nest in the dune of Little Cobb Island. Photo by Bryan Watts. Please remember to always keep a safe distance from active eagle nests – for your safety and to avoid disturbing the nesting pairs and their young. Please also remember that most of Virginia’s barrier islands are owned and managed by The Nature Conservancy, the U.S. Fish and Wildlife Service, and the Commonwealth of Virginia. Use policies and seasonal closures are in place to protect nesting birds – contact the appropriate organization for more information. Thank you.. I enjoyed learning about Bald Eagle nests! You are quite welcome! Always something new to learn about wildlife, I enjoy learning about it too! I didn’t realize Eagles made ground nests! And they are huge close up. Terrific post, Donna. Thank you, Jane! I did not either, can you imagine coming upon one?! It’d be quite memorable. 🙂 But I’d surely keep my eye to the sky for any Eagle attacks defending their territory, lol. I am surprised at how huge eagle’s nests can be. I was looking for an eagle’s nest as described by a friend and saw a large one, but but wasn’t sure. I scanned the tree tops and and wow! there it was , at least 5 feet wide.. Never heard of a nest on a beach-pretty amazing shots and kudos for your research! Hm-m-m, I wonder if Beau and Bella could fly over, at a safe distance, and take some tips on nest-building? Their nests are indeed amazing. We road out around an area yesterday that we hadn’t for a while and we saw three more Eagle nests I didn’t know about. I’m forever scanning tree tops and into through the woods looking up. I guess if there are no predators and lots of prey then it makes sense for the eagles to ground nest on treeless islands, the one on the beach is a bit risky though. I know someone who could learn a thing or two about nest building! I thought it quite risky, too, being out on the beach with extreme weather and higher tides/waves. They can’t possibly last in time like a tree top nest. I’m hoping the CCB continues to update on these beach nests. The Chesapeake Bay (other side of the strip of land/barrier islands also has uninhabited islands, it could start a new trend for the growing population. I’ve never heard of a eagles nest being on the ground before! As long as its an island and has no ground predators I suppose they would feel comfortable enough with building one on the ground. Were you in a helicopter to take those aerial shots or did you use a drone? I did not take the photos of the beach nests, they were part of the CCB article, taken by their researchers. They are pretty cool! very! I talked a friend of mine who is recognized as a leading authority on birds for the west coast yesterday and he was surprised as well. We both agreed that it had to be a island with no trees and no ground predators. now I’m wondering if you have the largest collection of land nests for eagles? There can’t be too many other locations but I must admit I haven’t searched? I hang around animals more than humans and as a result have noticed many things I otherwise wouldn’t of. Our knowledge of wildlife is limited because we simply do not hang out with them. I believe in the United States, the largest population of Eagles is in Alaska. And I agree, wildlife knowledge is limited to only those that can be watched daily. With the technology of webcams, we get to see so much within their ‘homes’, pretty neat-o! So your saying the largest “ground nesting” population of eagles is up in Alaska? I know Alaska has the largest population of tree dwelling eagles in the States but thats because the breeding population in the lower States has been decimated by DDT,habitat encroachment,hunters,farmers and others who want their feathers for ceremonial reasons. The feathers fetch a very high price on the black market! The eagles up in Alaska are also larger in size.The closer you go to either pole the larger the animals get. I’m sorry, I missed the ‘ground’ word! I’ve read that Eagles will ground-nest on coastlines in Alaska and Canada but I didn’t find any photos of such; I can imagine they are hard to find with the rugged land. The beach nests I shared off Virginia’s Eastern Shore barrier islands is ‘newly’ found in last couple years, I am sure they will be followed, and other uninhabited surrounding islands will be searched from air. But only as they are able to with the the laws in effect. that area may be the largest ground based eagle nesting area in the world? It would be interesting to find out if that is true? I guess any place with many isolated islands would be the place to start looking. I bet the bid experts who found those nests would know more! Can you contact them? Great photos! Do the male eagles primarily do the nest building? This is so interesting – to think that they would be nesting on the ground after years in the trees. I guess it shows their adaptability to change. Thanks for sharing your nest pictures as well as the article! Great post Donna! Blackwater is a great place for eagles … I remember seeing them there years ago. That nest on the beach is amazing! Thank you, Denise! The Eagle population has grown around BNWR, you’d be so surprised and excited to see I know! This was an education. Thank you. I aim to teach some one something about a bird or two. 😉 You’re welcome, Tom. Doesn’t that beat all? I’d never heard of ground nesting eagles before. I wonder if they are there because the fishing is good despite the fact that there are no trees or are they being pushed out of prime nesting areas by others? Nature always amazes us! Nature is indeed amazing! 🙂 The barrier islands are along the narrow eastern shore land of Virginia, with the Atlantic Ocean on one side and the Chesapeake Bay on the other. With the huge population of Eagles around the Chesapeake Bay region, I’m guessing it’s more on finding new prime nesting areas. The Chesapeake Bay itself in the last few years increased in record high quality readings. The abundance of Eagles and Osprey proves the fish are healthy and growing in population as well. An ecosystem that is finally working for the benefit of both wildlife and humans! That is good and most welcome news! It sure is good to see how well the eagles are doing there now. It’s the same here. THe beach nesting is really interesting: I had no idea! I know you’re with me on still getting excited hearing Eagles calling out in the distance and watching them soar. They must love Montana! You’re just making me miss the eagles nest back at my previous house where I watched a pair raise several batches of youngsters. Who would have ever expected to find a nest on the beach. That’s pretty wild! Great post! Oh, I’m sorry, Gunta, I bet they miss seeing you too! I hope that Eagle pair is flourishing well and on their way with another season’s of youngsters! Most interesting post Donna, especially seeing the size of these nests, and the beach locations. This is quite unusual behaviour. I suppose the absence of tall trees and predators led to this choice. Thank you, Ashley! I thought it also seems more risky with extreme weather generating from the Atlantic Ocean. The barrier islands are more in a large clump with lots of marsh and water canals. The other side of these islands and land strip of Virginia is our Chesapeake Bay and even more uninhabited islands (I wonder if those islands have been researched?). The Chesapeake Bay water quality is at record highs. With the abundance of fish, so now are the record high populations of Eagles as well as Osprey. It is a good feeling to know the ecosystem is working well now, because the government continues to give lower funds to support it. There are a lot of private groups that do continue to assist and research, thank goodness! Great images, and interesting info about the beach nesting pairs. How lucky you are to enjoy these wonderful birds year round. Interesting reading and terrific photos Donna. I also see shots from above. I assume this was done by a drone. The eagles are looking up and I bet they are scared of the sound. Normally a eagle has recourse to a high tree if disturbed but on the ground they are vulnerable. I assume anybody with a boat could now go out to these islands? The ‘normal’ animals on the ground are primarily marsh critters and coastal bird nestings. Check out Googles Map and search Eastern Shore of Virginia, Virginia. You will see the barrier islands to the right on the Atlantic Ocean side midway to the bottom of that strip of land. You can then search & see where each island is that is hosting an Eagle beach nest: Little Cobb Island, 1, VA; Wreck Island, 1, VA; Smith Island, 1, VA; Ship Shoal Island, 1, VA; and Cedar Island, 6, VA. They are spread out pretty well. The Virginia barrier islands are owned and managed by The Nature Conservancy, the U.S. Fish and Wildlife Service, and the Commonwealth of Virginia. There are strict policies and seasonal closures in place to protect all nesting birds throughout the islands. The CCB had support in doing fly-overs of the islands for nest counting. The Eagle nests are isolated, in and around marsh, mud, and water channels, nothing pleasant for humans. I am sure the areas are not being disturbed, and there is no one running around or boating up to/near these nests. After checking out Eastern Shore Virginia, search Blackwater National Wildlife Refuge, Cambridge, Maryland, which is where I see/photograph most of my Eagles and other beautiful wildlife. 🙂 An awesome place!! I checked out the places you mentioned Donna. Without knowing exactly where a nest is I don’t think I could find it. I did see a structure on Cobb island at the north end. Nothing on Little Cobb island. It all looks like a fascinating place! Thank you for explaining. 86,430 visits. Thanks for stopping by!